Mood: Odd, I told you.. Listening to: Music, for a change. I started listening to Robbie Williams and then I migrated to Blink 182 and right now I’m listening to Pet Shop Boys – Always on my mind. I love that song. It’s so 80’s. Yeah, I don’t know why I’m in an odd mood, but it’s not a bad odd.. it’s a good odd. I feel inspired to do something, but I don’t know what that something is. Maybe I’ll try to write something. Maybe that’s why I’m here right now. It’s also been an odd weather today. Started up sunny, and we knew we’d get a thunderstorm later.. and I found a new website that tracks lightning strikes all over the world.. I was looking at that, having a 30 second update thing going. I wanted to know just how bad it’d be.. if I needed to unplug everything to save things from being broken. I don’t want to repeat last year. And I was checking the Swedish weather thing, cause apparently it’s better than the ones we have. Oh well… The thunderstorm came.. and it didn’t even really come close enough for us to worry. Speaking of things in the sky… Tomorrow we’re heading into the tail of a comet, so there’ll be a meteor storm. Only problem is.. it’s between 8am and 10am.. It’s not going to stop me from looking, tho. Two days ago I went with a good friend of mine to get one of her tattoos covered up. The tattoo artist did an AMAZING job…. 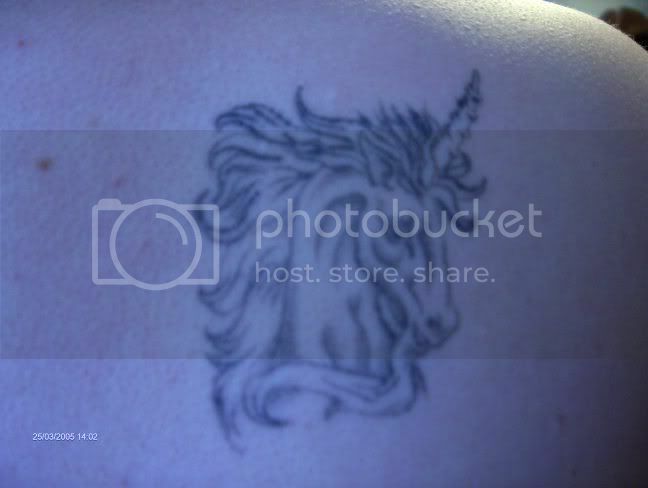 and I’ve realized that having a unicorn tattoo isn’t really that cool. I mean.. It’s not the traditional unicorn… but I don’t know… I don’t regret getting it, it’s just… I don’t know. I want a big purple rose instead. I don’t know… Maybe I’ll keep it and get a big purple rose somewhere else. I can see how it was too.. Suddenly I had the money for it.. and this rub-on tattoo thing that looked cool… Oh well. Now I’m going to check out Adventure Bits on Youtube. I see Morgan has made a new update. Have to see how he handles Blight Town..
Be utterly fantastic to each other.